Despite the ever increasing hype over knitting (and yarn work in general), knitters receive a lot of flack for what they make. Things are either too small, too large, too tacky, too impractical, too inappropriate (I think this just goes for the knit bikini), etc. And during these past few months, the chief complaint we worsted-weight weavers receive is that everything we make is too hot. And I understand. I mean, summertime is not the best season to be dressed in head to foot alpaca. But thankfully, we are heading towards a season that I consider a perennial purler’s paradise. Firstly, as fall approaches, the weather gets a bit cooler, permitting people to wear light knit scarves and cardigans. Secondly, this is the perfect time to start on that long list of Christmas knits you planned on making for your family! Believe me when I tell you that the fall season is a knitter’s knirvana. 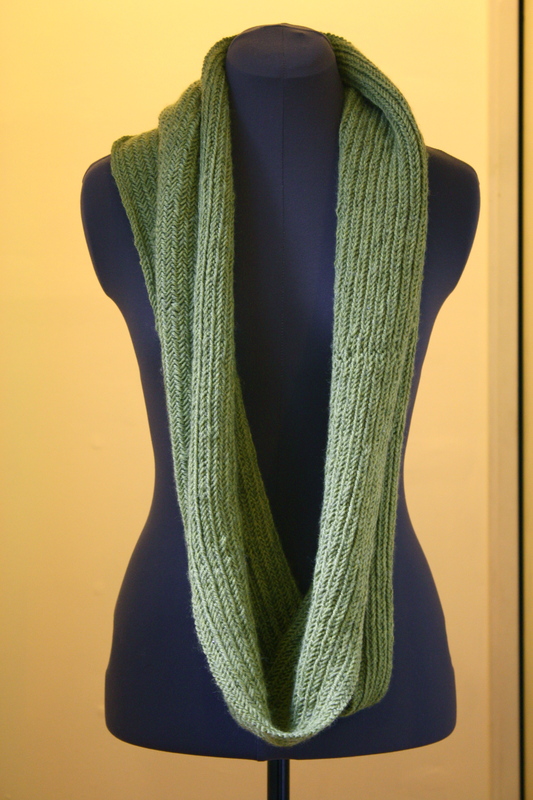 You can literally knit anything, chunky or light, and either wear it yourself or give it away as a Christmas present. Okay, fine, it’s actually just a circle scarf (Technically, cowls are worn covering the head, whereas scarves and shawls are worn around the shoulders, and wraps and throws are worn around the upper body. Oh yeah and saris are worn around the waist.). If you can’t tell, I was going for a really nice, huge, plush circle scarf that will essentially swallow your entire face. Now tell me that doesn’t look face-swallowing. 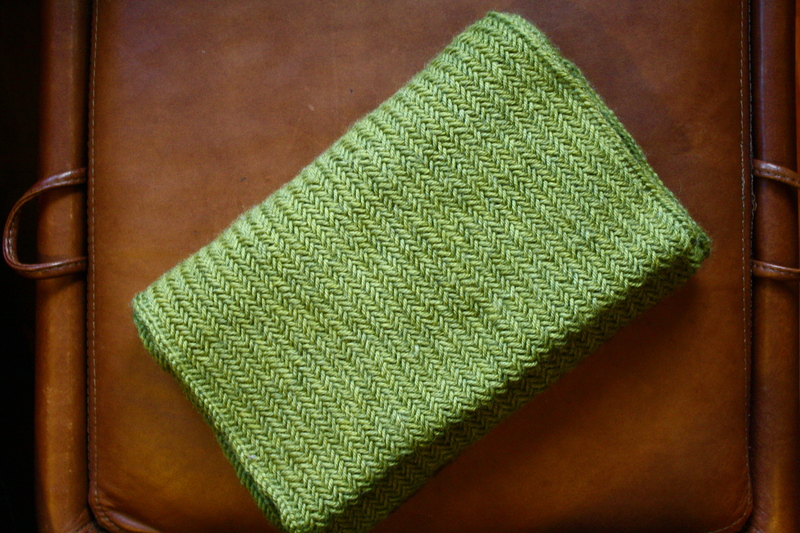 This Herringbone cowl is comprised of a single stitch (none other than the Herringbone stitch), and you can find the pattern I used here. 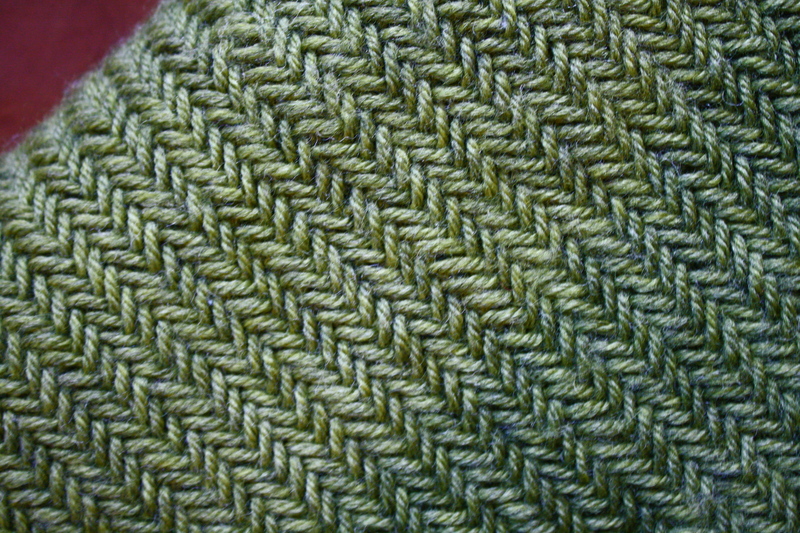 The thing about the Herringbone stitch that I like so much is that it’s very distinct from any other knitting stitches. For one, you can’t see any obvious knits or purls, which can sometimes look tacky on scarves (especially if they’re uneven). 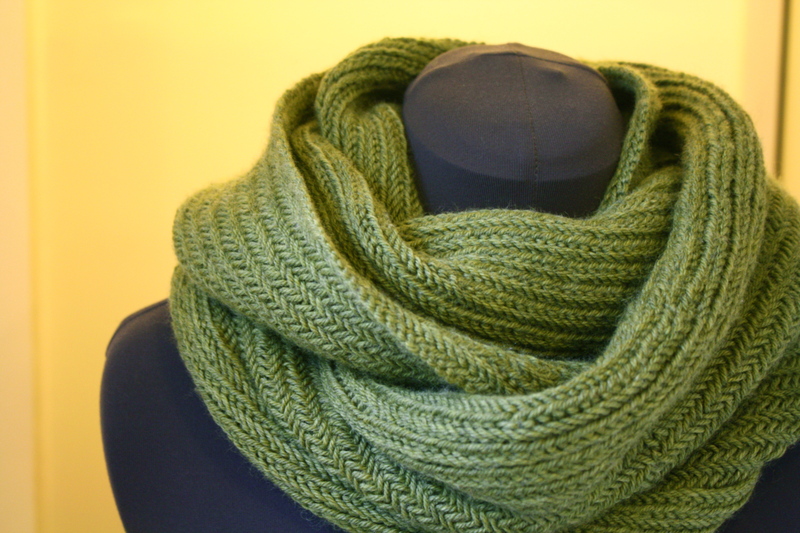 Moreover, each stitch is doubly knit (read the pattern for details), making this cowl incredibly thick and warm around the neck. Also, the fact that the backside of this cowl has just a nice of a pattern as the front doesn’t hurt. Alas, there is one downside to this otherwise ideal cowl. It was not made from recycled yarn. 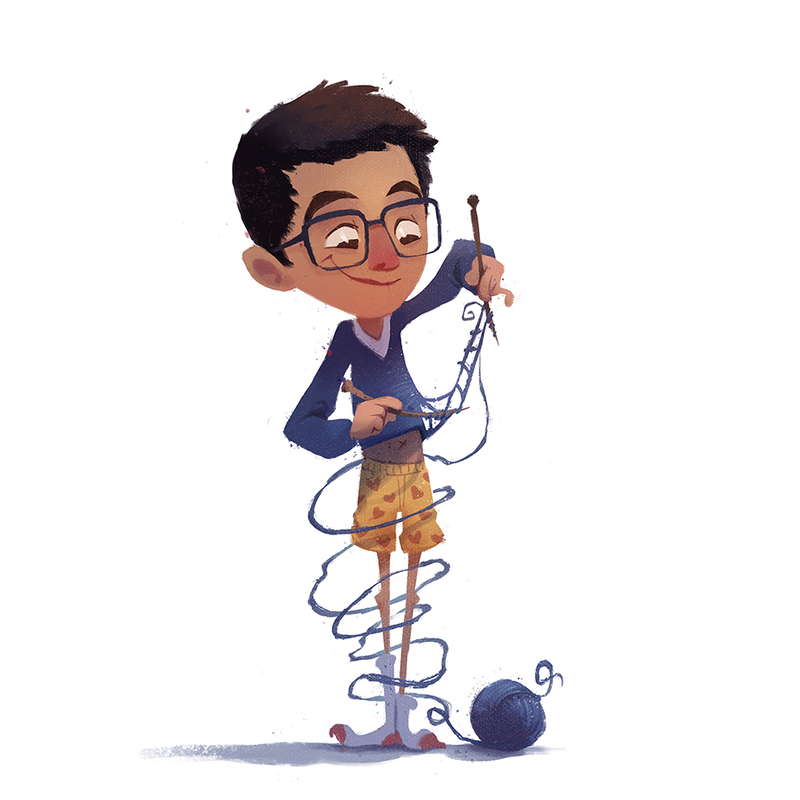 Yes, indeed, the Earth wept every time I knit a round, but I swear I have a good reason. As it turns out, for the past few months, I have actually been training to fill the shoes of my colleague who will be leaving at the end of the month (Just like in MIB, except that my colleague looks nothing like Tommy Lee Jones). So, as a gesture of thanks, I decided to pull out all the stops and knit her something out of virgin yarn. I understand that this is a distinct gesture of gratitude; Some people would organize a goodbye party, others would write letters or bake cookies, and heck, some would even just say thank you. But that’s a bit forward for my general take on how to approach life, so I think I’ll stick to random knitted presents left on their desk at the end of the day. And as a side note, I’m making another one of these scarves but in black, so let me know if you’re interested. For those of you who have seen me often these past few days (aka mom), you’ll know that I actually finished this cowl around two weeks ago, but just haven’t been able to write a post about it until now. Why, you ask? Oh, how considerate of you to inquire while simultaneously switching seamlessly to my subsequent subject. This past week, I was a counselor at Camp Kesem, a free summer camp for children whose parents have/had cancer. So, for 144 straight hours I, along with seven other counselors, was a Yellow Meteor, taking care of sixteen 10-year-olds as they rock climbed, canoed, swam, and arched (sorry, couldn’t think of a paralleling past participle for “do archery”). Now, these activities are moderately rigorous and challenging, but the real battle for me occurred at 9:30pm each night, when me and two other brave souls were trapped in a cabin with nine 10-year-old boys. As a 22-year-old, I have a limited number of elementary school friends and know little about them, which put me at a great disadvantage when dealing with these kids. But over the week, I was able to make some key observations about my campers. So, if you plan on befriending a 10-year-old boy in the near future, or perhaps birthing one, please read on. Wait. I just previewed what I wrote and realized that it’s been a long time since you’ve looked at a picture. 1. farts. I know what you’re thinking: “Of course 10-year-old boys love it when people fart. That’s obvious!” Well, wrong. Kids don’t love it when people fart. They love farts. And it’s more than just thinking farting is funny. They just love the concept of a flatulence event in its entirety. The first night in the cabin, there was a full 5 minutes without any intervening dialogue devoted to the making of farting noises. And when I say farting noises, I don’t mean amateur sounds made with your armpits. I’m talking about well rehearsed hand positions and very specific air stream mechanisms. These kids practically winded themselves making these sounds. I swear there must be something on their tiny little prepubescent Y chromosomes that wire them this way. 2. bedtime is a battle. The actual falling to sleep is rather simple and occurs in a matter of seconds. The challenge comes in getting the boys to realize that they’re about to go to sleep. I first decided to give them a few minutes to sit quietly in their beds reading. This would calm them down and prepare them for sleep, I thought. Wrong. The sustained visual stimulation that light brings only riles the boys back up. So then I kill the lights and lie in my bunk, hoping that we can all drift into sleep together. Wrong. Deprived of visual cues, the kids grasp at any auditory stimuli they can find to keep them cruising on consciousness. Ironically enough, it’s the sound of snoring that does this. One kid starts snoring, the rest start laughing, the sleeping kid wakes up, and we’re back at square 1. Finally, I do the only thing that works when dealing with society’s most uncooperative citizens: I walk back and forth along their bunks like a jail warden, looking each one in the eye, daring them to defy me. 3. strong. Despite the fact that these kids are less than half my age, I have witnessed incredible strength and courage in them that I don’t even see in myself. Having the word “cancer” appear in the context of our conversations felt uncomfortably unnatural, and it should be. There is just something wrong about that. It’s not fair for a 10-year-old to have “lymphoma” roll off their tongue so easily or to know what a “glioblastoma” is. These are grown-up concepts that belong in a grown-up world. But this past week I’ve seen these kids display a paradoxical maturity by choosing to be a kid. I realized that things like loving farts and resisting bedtimes isn’t inherent to any child, it’s a choice. Most children don’t have much to choose from, but to these campers, who have been presented with the full, unadulterated truth about their families, a childhood is something that must be fought for constantly. And I’m proud to admit that up to the very last day of camp, I was dragging each and every one of my campers to bed amidst a symphony of flatulence.